This 3 day starter pack is just what you need to start Kiteboarding. Designed to get you up and riding with safety and confidence the 3 day course is based on the IKO Teaching standard and aims to complete the IKO level 2 Certification. 3 Hour Kite Control Lesson on the beach. First you'll learn to fly a small trainer kite for about 1 hour, this teaches you kite control, theory and safety without the power of larger kites. The next step is to fly the small 4 line inflatable kite. You'll learn kite set up and the safety systems then how to fly the kite with control. You'll complete this step when you can show full control of the kite, the depower system, 1 handed flying and safety systems. 3 Hour Body Drag Lesson in the water. Now it's time to take the kite into the water! You'll be flying a bigger kite now with longer lines but no board yet. You'll first learn to enter and exit the water while flying the kite, what we call Body Dragging through the water. You're Instructor will be right with you to help you and keep you safe. You'll learn how to harness the power of the kite and how to re-launch the kite incase it crashes into the water. The final step is 1 handed upwind body drags and being able to navigate independantly in the water. 3 Hour Water Start Lesson in the water. It's time to try the board for the first time. Now you have the kite control and confidence to enter the water, handle the kite with 1 hand, put the board on and take your first rides on the board. Even if you fall off you'll know how to body drag back to your board and restart. You're Instructor will be with you for the first attempts, our goal is to get you riding safely and independantly. Once competed you'll be certified IKO Level 2 and you'll be ready for an Upwind Lesson or Supervised Rental. One-on-one Instruction with personalized learning at your own pace. These private kiteboarding lessons will get you up and riding in the shortest time as you have all the attention from your instructor. Alternatively private lessons are great if you want to learn at a slower pace and take shorter 1 or 2 hour classes. If you are taking lessons alone then Private Kite Lessons are for you as we can’t guarantee a place on a group lesson when schedule, student level and language all become a factor. Great for couples or two friends wanting to take lessons together. These semi-private kiteboarding lessons allow you to have maximum time flying the kite as each student has a full set of equipment included in the class. Your IKO Instructor will train both of you at the same time and an assistant will also be on hand at all times to ensure safety. Please make sure both students have the same schedule, level and language. Great for families or groups of two to four wanting to take lessons together. 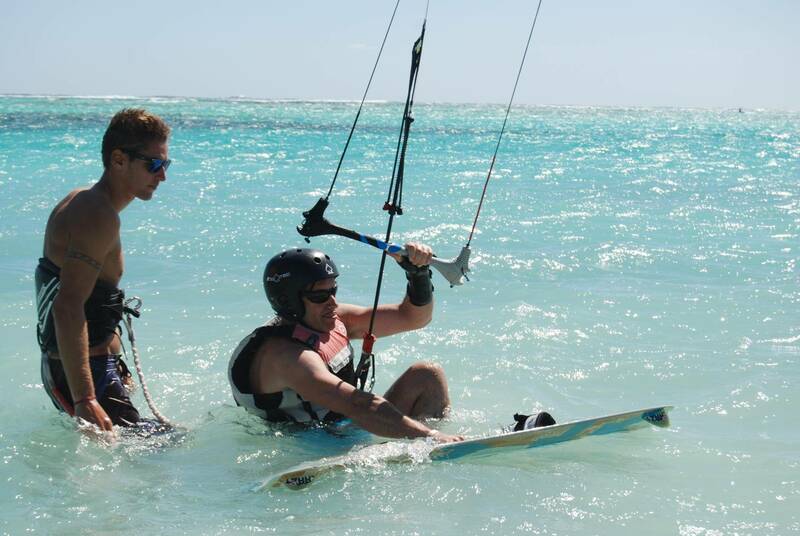 These Group kiteboarding lessons allow you to learn kiteboarding while taking advantage of group rate savings. Your IKO Instructor will train 2 to 4 students together sharing 1 Equipment set between 2 students. Please make sure all students have the same schedule, level and language.